If you've been thinking about getting your car checked over, this may be a perfect time for a thorough inspection of your vehicle. I say this because of the harsh weather we just came through here in Chicago. The double whammy of the deep snow and bitterly cold temperatures tend to really take a toll on our automobiles. Here are some things we have noticed in the shop that relate to both of these severe weather conditions. Transmission problems can result from being stuck and having to rock your car back and forth for long periods of time to get out. Sometimes it's as simple as changing out the burned transmission fluid, but it can be more serious to the point of having to replace the transmission assembly. Sliding around a corner and into a curb not only can blow out a tire and bend a wheel, but it can also bend some of the steering linkage or suspension, causing your car to be out of alignment. 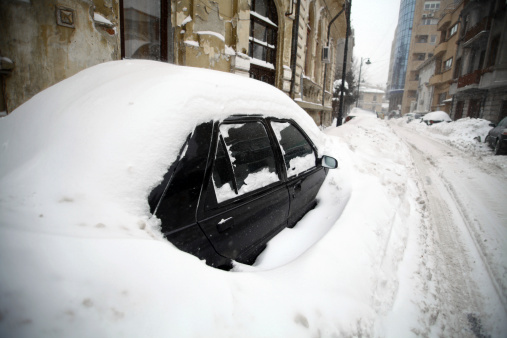 We have seen deep snow tear off an exhaust system or part of the system that may have been degraded by rust. If you notice the car sounds a little different, this may be the problem. Windshield wiper blades and or linkage can get damaged or worn out from use with excessive snow buildup on the windshield. The windshield washer pump or spray nozzles may not be work properly anymore. Windows that will not roll up or down any longer may have gotten off track or something may have broken in the mechanism down in the door. This can happen due to ice or snow build up on the window. Water pumps can begin to leak coolant, either from the mounting gasket or the water pump seal. We have had to replace quite a few radiators because they develop antifreeze leaks from the radiator tank seam. Any place there is a gasket on the engine can be affected by the cold temperatures, so it is a good idea to have the engine checked for any signs of coolant or oil leakage. Any warning lights that have come on in the winter should not be ignored; they are on for a reason and it should be investigated. It's possible you may have noticed a heater that was ineffective in the really cold weather but is good enough with more moderate temperatures. This should be checked further because if the engine does not reach operating temperature, it could affect performance and can have a big impact on fuel economy. They have come up with a two-piece backing plate now that doesn't require as much disassembly and will help keep the labor costs down. For anyone who has declined this service in the past because of the cost, you may want to look into this option and see if it fits the budget a little better.